Alphonso mango is also known as Alphonso, Alfonso, Alphanso, Hapus, Hapoos, Bombay variety, etc., this variety is often considered to be a king even amongst the ‘King of fruits’ and is widely considered to be the tastiest fruit in India. Alphonso mangoes are only available in India. Most of the cultivation takes place in Maharashtra State and half of the state’s harvest is from Ratnagiri district. 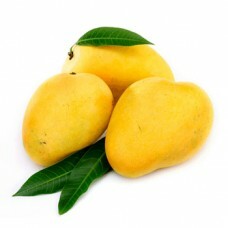 The Alphonso Mangoes that come from Devgad region are known to be the best ones. Alphonso Mangoes are oval in shape and about 4 to 6 inches long. The skin of the ripe fruit is golden yellow in colour, but is inedible. It has a thin firm skin and a delicious pulp. It has high nutritive value, wider adaptability and enormous viability. Mangoes are rich in pre-biotic dietary fiber which help in digestion, vitamins, minerals, and poly-phenolic flavonoid antioxidant compounds. Fresh mangoes are a very rich source of potassium. Potassium is an important component of cell and body fluids that helps controlling heart rate and blood pressure.